Seniors often feel anxious about their dependence on others, especially when it comes to hygiene and other personal matters. When you care for a senior loved one, it’s important to make sure you help him or her maintain a sense of dignity. Use the following tips in your daily routine to help your loved one feel more comfortable and confident. Whether your loved one is in the bedroom or bathroom, knock first instead of opening the door right away. Knocking before entering is a simple yet effective way to prevent a loss of dignity that could occur when your loved one feels as though his or her privacy has been invaded. Seniors can face a variety of challenges as they age, many of which can be mitigated with the help of professional in-home caregivers who provide high-quality home care. 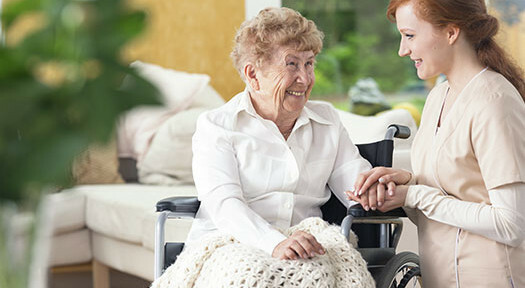 Orlando families trust in Home Care Assistance to help their elderly loved ones age in place safely and comfortably. Many seniors have a difficult time adjusting to a loss of independence when they have to rely on others. Although your loved one might need help with bathing, preparing meals, and doing other daily tasks, providing choices as often as possible may help him or her feel more at ease. For example, ask which outfit your loved one would like to wear. The ability to make simple choices can help seniors feel as though they still have some control over everyday life. Make sure your loved one can use the bathroom privately if it is safe to do so. Stand off to the side until your loved one needs assistance getting up from the toilet, or stay in a nearby room if he or she doesn’t need immediate assistance. Keep in mind you should still make sure your loved one is safe from falling or getting hurt while in the bathroom, but you can do so while respecting his or her privacy. Living independently is important for seniors who want to maintain a high quality of life. For some, this simply means receiving help with tasks that have become more challenging to manage over time. Even when families have the best intentions, they may not have the time to provide the care their elderly loved ones need and deserve. If your loved one needs help for a few hours a day or a few days a week, reach out to Home Care Assistance, a trusted provider of respite care Windermere seniors can depend on. Seniors who need help with everyday tasks should feel comfortable bringing up any concerns they have. If your loved one is unhappy or feeling upset about something, encourage him or her to discuss these concerns and provide input and opinions about the way he or she is cared for. You might not realize your loved one is feeling a loss of dignity or respect, and he or she might be too anxious to bring up the subject with you. Make a habit of communicating with your loved one often and asking if there is anything bothering him or her. When you’re talking with other people about your loved one, such as a healthcare provider, make sure your loved one is included. Rather than talking as if your loved one is not in the room, give him or her a chance to speak so he or she does not feel ignored or treated as being helpless. Letting seniors speak on their own behalf when communicating with doctors and others who provide care for them is an important part of helping them feel less vulnerable and more in control. A feeling of loss of dignity affects quality of life in seniors. If your elderly loved one needs help maintaining a high quality of life while aging in place, reach out to Home Care Assistance, a trusted provider of Altamonte Springs home care. Our caregivers provide transportation to and from medical appointments and social events, nutritious meal preparation, assistance with daily exercise, and help with everyday tasks like bathing, grooming, and light housekeeping. Call us at (407) 604-0506 to learn more about how our experienced in-home caregivers can benefit your loved one.